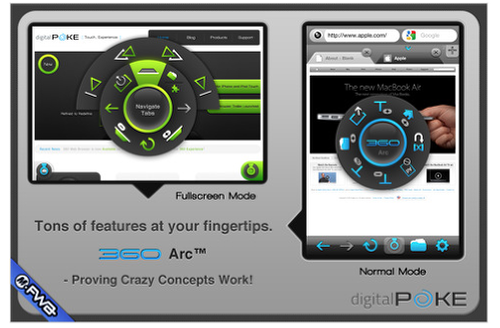 Digital Poke brings you 360 Web Browser with more features to offer than any other browsers out there with a refreshing, non-monotonous interface. Version 3 gets you Firefox Sync, Download Manager, ability to view Flash Videos* using CC Plugin, Media Player & Dropbox. Have fun with something new. “Blast” photos in an amazing way to create comical “trios” and funny faces. Share them full-size or as app-style icons. Imagine a photo printed on a magic elastic canvas. Imagine that you can “blast” it so that the photo morphs sharply and extensively, even splitting into pieces. 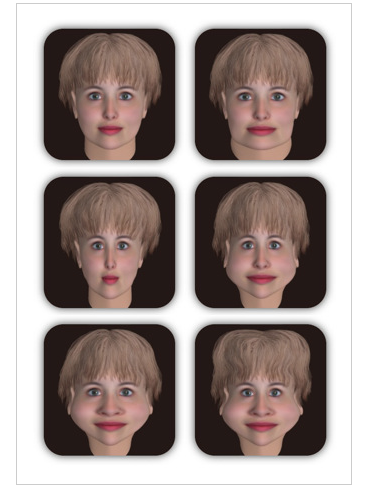 You can smoothly adjust the morphing and watch it animated. You can start from watching built-in live demos. More description and tips are in the built-in Guide pages. You are trying to set the record for longest fall by a skydiver. 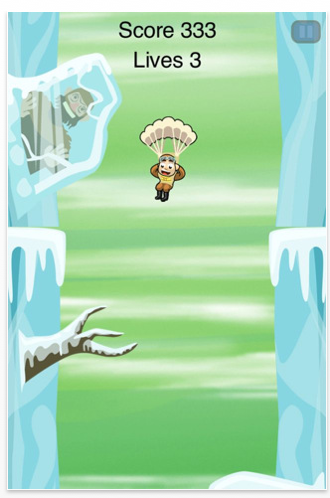 Steer clear of obstacles to avoid damaging your parachute, and collect powerups to fall as far as possible! The farther you fall, the larger your score grows! – Game Center Support: compete with your friends! 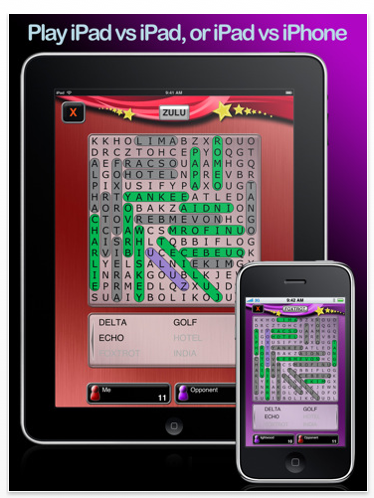 Word Search Party is a polished and fun word puzzle game which lets you challenge your friends or find opponents online using Game Center. It’s the first ever competitive multi-player word search game, and the best looking and most playable word puzzle on the App Store! ☆ The first ever competitive multi-player word search game! ☆ Unlimited puzzles – it’s different every time you play! Mother Tucker, LLC today is pleased to announce BlueCam Free 3.0, an update to its popular video still camera app for iOS. Designed originally for iPhones with built-in Bluetooth support, BlueCam Free gives users an alternative to the built-in Camera app which has remote control ability, 9x digital zoom, auto and manual uploading to Faceback/Flickr/Twitter, photo and video timers, photo filters and many other features. The most significant features are allowing the remote control user to: view a live camera preview; voice chat; and view a Google map with a video map pin. No more lugging around binders of scores from practice to concerts. Users can import and manage thousands of scores with ease and then arrange them into sets in the order in which they desire to perform them. Musicians can capture practice sessions or live performances with the built in audio recorder and then share the songs via email or export them to their iTunes library on their Mac or PC. Whether it’s practice, auditions or concerts – performing will never be the same. LED Flare 2.0, an update to their iPhone 4 flash app for iOS. 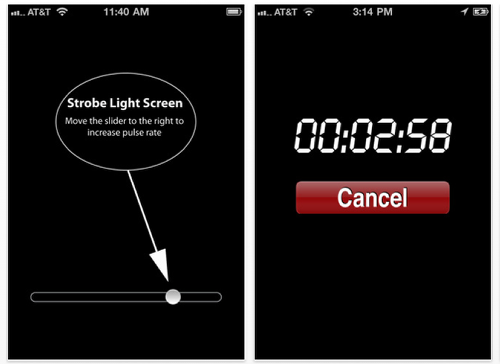 LED Flare is a gesture-based flash and strobe On/Off switch with a flash On/Off timer. Designed originally for flash equipped iPhones, LED Flare gives users instant-on-flash and a big flash and strobe On/Off button so they never have to look at their device to turn things On/Off. The most significant features are its: gesture-based flash and strobe interface; stealth gesture-based camera interface. 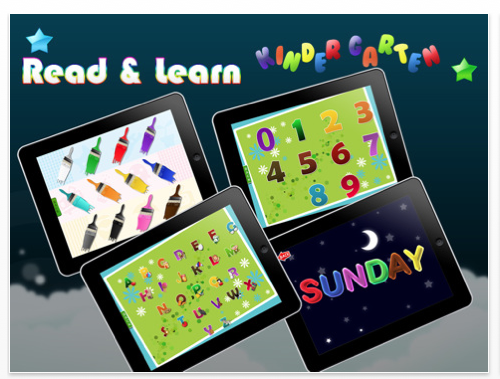 * Black Status bar to monitor battery life, date time, etc..
Kindergarten is an early education application that teaches the basic required for each and every kid through various activities and games. The application has been designed in such a way that it gives importance to the holistic development of your kid by assessing the combined knowledge and skills of your kid. We realized that most of the educational app in the App Store offers your kid limited features which makes them feel turn off after certain period of time. Kids will enjoy learning only if they don’t get the bookish feeling but some entertainment. Kindergarten has been developed keeping the above points in mind that gifts a kid with the talent which every parents expect to see in their child. iPhone development studio Razeware LLC today is pleased to announce the release of Wild Fables 1.0, a free interactive story app for the iPhone, iPad, and iPod touch. Wild Fables puts a fresh spin on classic Aesop’s fables with original artwork, stories, and unique physics-based interactivity on every page. Each Wild Fable tells a classic Aesop’s fable in a new way designed specifically for fun family interaction. Everything moves, encouraging users to poke, swipe, and drag objects and characters. The iPhone or iPad can be tilted to move animals and objects about the screen. Custom, hand-drawn illustrations bring the fables to life, and users will appreciate sound effects, music, and surprises as they interact with the stories. 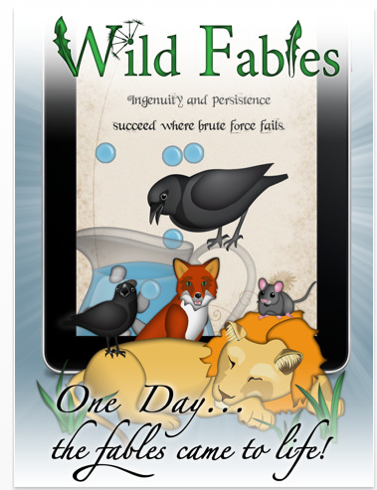 Wild Fables is a universal app and works on the iPhone, iPod touch, and iPad. It is a free app with one story for free (The Crow and The Pitcher). Users can try it out and see if they like it – more Wild Fables are available as in-app purchases. The app supports Game Center support and achievements and has full HD resolution for the iPhone 4 Retina Display. Anyone who loves animal stories or reading and playing together with kids should pick up Wild Fables today. A video trailer is available. Ben the Tractor drives all over the farm searching for the lost sheep. While reading, a child discovers hidden animations of animals, the tractor and other characters. On different pages of the book the child has to find the sheep and then herd them to the corral. 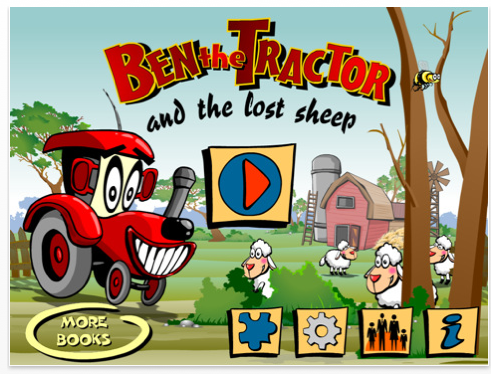 Interactions also include the sheep singing "Old MacDonald Had a Farm" and moving Ben the Tractor by tilting device. Pickin’ Sticks, available on the Apple iTunes App Store, celebrates it’s first major update with a complete overhaul and optimization. Jonathan Tenkely has released Pickin’ Stix 2.0 for iPhone, iPod touch, and now iPad. The popular game, developed for quick play, has been completely redesigned from scratch. With all-new graphics and game play mechanics, optimized for the iPhone 4 and iPad, each round is a unique challenge. Players can now choose from 5 unique stick designs each time they begin a completely new game. With a new light hearted soundtrack and high score record keeping, players can now enjoy the challenge of trying to achieve their best time possible. In addition to the free iPhone and iPod touch update, for existing Pickin’ Stix owners, iPad users now have their own adaptation to enjoy. 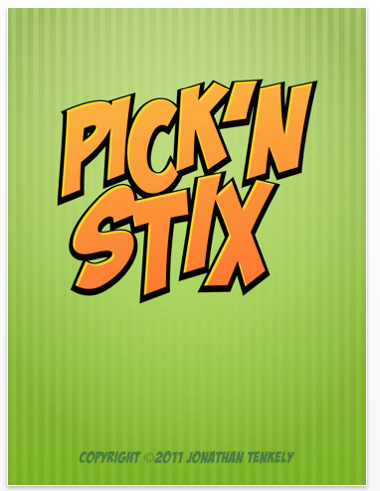 Pickin’ Stix can be downloaded on the Apple iTunes App Store today. Imesart has announced Audio Memos 2.79, a new upgrade that gives iOS users even more great ways to create, edit and share audio recordings. The "record on startup" feature makes it easier than ever to create new recordings. Voice activation with adjustable parameters helps users define when recording is taking place. Automatic sending by email, to Dropbox, iDisk or FTP servers is a powerful way to share recordings. Audio Memos is available on the App Store. After 28 updates, Audio Memos is recognized as one of the most feature-packed recording apps for iOS. "Audio Memos is just loaded with tons of amazing features that are implemented in an easy and natural way… a great full featured audio recorder" said AppAdvice. 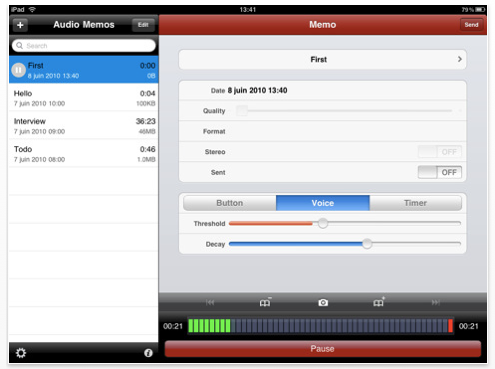 Its amazingly intuitive interface has led Audio Memos Free to be featured in "Incredible iPad Apps for Dummies". Audio Memos also includes several unique features. A normalizing filter makes sure every recording is played at the same volume, no matter if the voice of a faraway speaker or live music was recorded. Automatic alerts remind users to listen to a recording. Position markers let users highlight important moments and fit perfectly with the powerful audio extraction tool. A complete in-app user manual allows anyone to make the most out of Audio Memos. 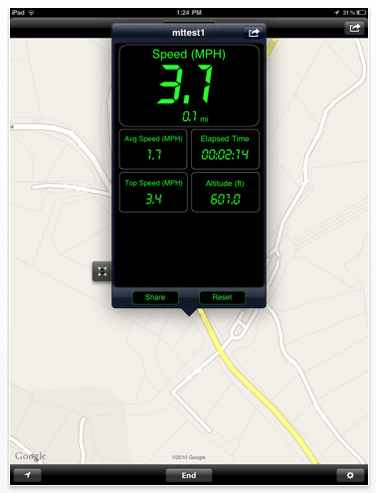 Mother Tucker, LLC has announced the release of Speed Tracker 2.2, an update to their popular realtime GPS sharing and monitoring App for iOS. Speed Tracker allows users to monitor the location, heading and speed of their device and other iOS devices on the internet at the same time on a Google Map. Designed originally for Game Center equipped iOS devices, Speed Tracker allows you to track, report and share your speed when you’re not connected to another player. 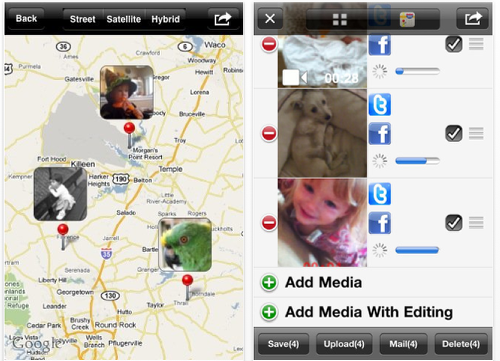 Offering Universal iOS device support, version 2.2 adds the GPS course and In-App Friend Requests. 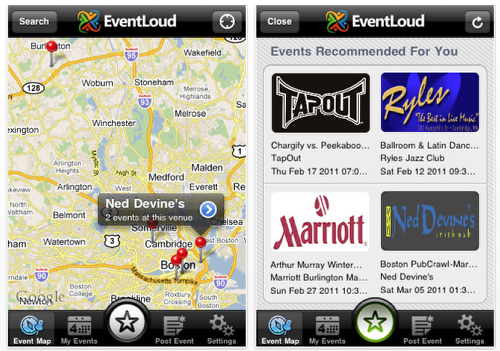 Available on all mobile devices running on iOS 4.0 or later, EventLoud is a unique social connectivity tool that helps users parlaying their social networking connections into real-world connections by getting people together via spontaneous user-generated events. This app accomplishes this with ease by helping users create and organize public events that anyone can sign up for, and where like minded friends and acquaintances connected via virtual networks are able to meet in a fun, safe, and – perhaps most importantly – fun setting. Recently updated, version 1.5.4 of this app allows users to login using their Facebook account and preview events without logging in or even registering. EventLoud is currently available for download on the Apple App Store for free, requiring iOS 4.0 or later in order to run. 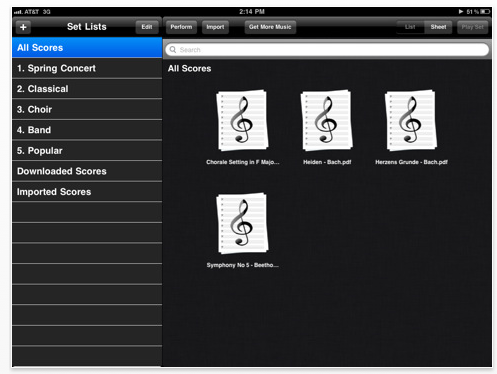 Audiolio 1.4 is now available in the App Store for iPad. 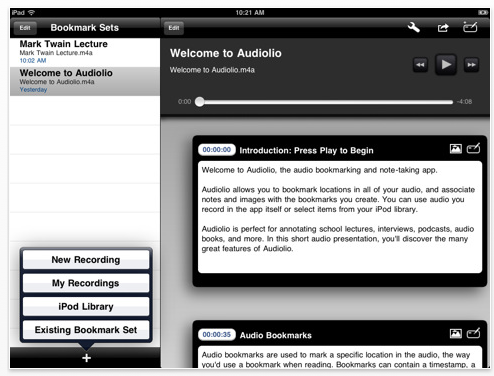 Audiolio now supports Text Expander Touch. Text Expander Touch is a great app that allows users to create text snippets that are automagically expanded out into larger blocks of text – a huge benefit for entering text on any mobile device. Text Expander Touch is a great complement to Audiolio, and will greatly assist users trying to keep up with note-taking during lectures, interviews, and meetings. "Adding Text Expander to Audiolio will provide our users with the benefit of taking notes more efficiently," said Doug Dimola, co-founder of Escape Velocity Apps. "We are listening to the requests of our growing user base, and adding Text Expander is just one of many improvements, that will enhance our user experience." Happymagenta has announced the release of Spyglass 3.0.3, a special iPad 2 update to its popular multi-functional augmented reality navigation tool. Offering a remarkable combination of useful and fun, Spyglass is an augmented reality navigation tool which combines features of a milspec compass, GPS tracker, sextant, optical rangefinder, angular calculator, color lens camera and a variety of other navigational tools within a single, easy-to-use application. It makes full use of latest hardware features of iPhone 3GS/4 and iPad 1/2 Wi-Fi 3G as well as software capabilities of iOS 3.1 and higher. During past years Spyglass is one of the top selling and most remarkable navigation apps in the US and other iTunes stores. Spyglass has been repeatedly featured in iTunes, including "Rewind 2010: Hot Trends in Apps" award along with "Augmented Reality: The World Around You", "New and Noteworthy" and "What’s Hot" categories. With its wide array of navigational, tracking and mapping functions, Spyglass lets travelers, hikers, fans of the outdoor and navigation geeks plenty of possibilities to explore, measure and never lose track. 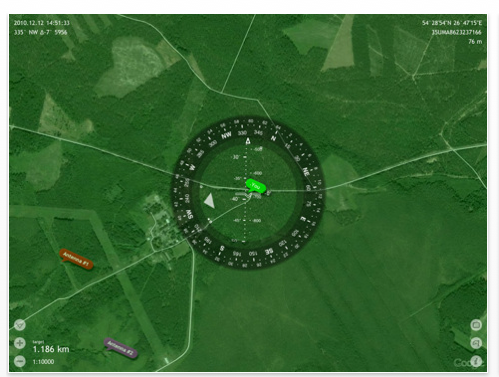 Tracking map locations, compass and gyroscope data, custom targets and even stars is easy with the program’s advanced heads-up display and augmented reality markers. Playrix Entertainment, developer and publisher of Fishdom, Royal Envoy, Call of Atlantis, Gardenscapes, 4 Elements and other casual games, has announced that its two award-winning games Fishdom H2O: Hidden Odyssey HD and 4 Elements HD had launched on the App Store. The titles are available for iPad in the App Stores worldwide at the introductory discounted price of 4.99 USD. "We are happy to see two more Playrix games hit the App Store last week. Our expectations about the performance of these titles are very high. Both games have been adapted accordingly and their gameplay fits perfectly the touch screen. Playing them on iPad feels very natural." Company also announced that it will continue to bring its entire games catalogue to the vibrant iOS platform. 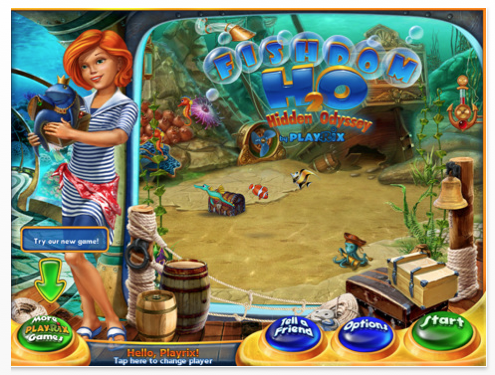 Fishdom H2O: Hidden Odyssey(TM), the first hidden object game in Playrix’s portfolio, is a sequel to the best-selling puzzle, Fishdom(TM). A smooth combination of hidden object and sim, Fishdom H2O: Hidden Odyssey(TM) takes players to the bottom of the sea to collect numerous hidden items to earn cash and build up their dream aquarium. Released in August 2008, 4 Elements(TM) showed spectacular results and garnered very positive reviews from media outlets of all kinds, including IGN that rated the game 8.0 out of 10.00 stressing its spectacular graphics and visual effects. The title is a unique mix of Match-3, Hidden Object and Spot-the-Difference where players need to unlock the 4 ancient books of magic and thus restore the magic kingdom to life. 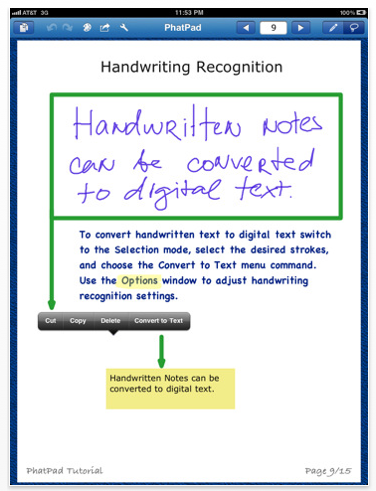 PhatWare has announced the release of a new version of PhatPad for iPad, a note-taking and collaboration app featuring PhatWare’s proven handwriting recognition technology. More than just a note-taking app, PhatPad turns an iPad into an advanced brainstorming tool by enabling users to draw, write, and type on the iPad, then instantly share ideas via email, WiFi sync, Dropbox, or with PhatPad’s built-in presentation mode. PhatPad 1.2 delivers powerful new features to improve note-taking and collaboration on an iPad. In this fast-paced puzzle game, players connect long strings of like-colored marbles to eliminate them from the board. Plus, get awesome power-ups by including bonus marbles in your marble groups! Even more intuitive than standard "match" type games, this fun puzzler was designed specifically for the touch screen capabilities of iOS devices. Bust A Marble features 20 levels of high-energy play with a dazzling array of colored marbles that increase the difficulty of game play. Advanced special effects such as lightning zaps, explosions, fire, realistic sound effects, vocal feedback, and groovin’ techno music create a full gaming experience that you won’t want to miss. Plus, you can earn special Achievements in Game Center and compare your awesome high score to your friends’ scores! This will soon be everyone’s favorite game! 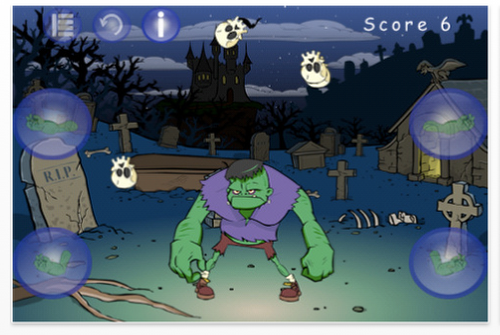 Sysapps has announced the release of Zombie Juggler 1.0 for the iPhone, iPod touch and iPad devices. Get ready for some fast juggling action! Zombie Juggler is easy to learn hard to master. You have four buttons to control the zombie into four different positions that will allow you to catch the flying skulls. The skulls fly faster and faster and you must not allow any skull fall to the ground – sounds easy we dare you to try. With Zombie Juggler you will not stop juggling. Zombie Juggler is about eye to hand coordination. If you have eye to hand coordination you will improve it and if you do not have eye to hand coordination you will gain it. Zombie Juggler will help you gain higher level of concentration. You will notice that every time you play this game your concentration and coordination just gets better and better allowing you to beat your friends. It is all a matter of practice. Try to beat your friends by practicing your juggle skill and check your world rank in Game Center. Challenge your friends through Facebook, Apple Game Center or via eMail and see who is the best juggler in the world. This is not JAZG (Just Another Zombie Game) it is The King of Zombie Casual Games. We believe it is The Most Addictive App Store zombie game. Zombie Juggler is a Must Have! This app takes a unique approach to how to use the iPhone. The iPhone is positioned stationary in the room and the interaction occurs on the projected desktop image. Using customized image processing technology, the app detects the LED light, and transmits the new location to the computer. The computer moves the mouse cursor accordingly. 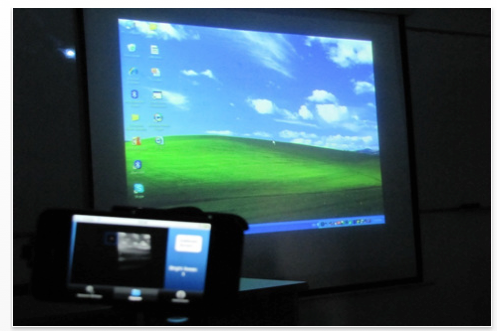 This technique allows the user interact directly with the computer while standing in front of the wall-projected desktop image, away from mouse and iPhone. 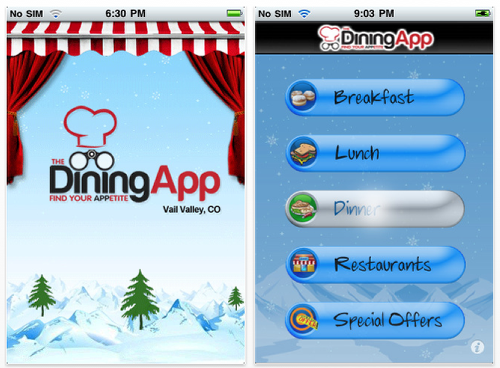 If you’re headed to the Vail Valley this season for outdoor adventure or a romantic weekend then you better download The DiningApp right away, the most comprehensive restaurant guide for the entire Vail Valley and includes every dining style available. Free download for iPhone, BlackBerry and Android. Looking for Pad Thai, Portabello Paninis or a Breakfast Burrito? Just type in your breakfast, lunch or dinner favorites to instantly search a database of nearly 140 restaurants in the Vail Valley and browse through thousands of menu items, including a range of Mexican, Italian, Vegetarian and Chinese. Each specialty restaurant listed in the app has unique food and ambiance that wows visitors and tourists alike. Skiing, golf, soccer or music? The Vail Valley is a fantastic place to be in. And when you’re hungry for something to tantalize your taste buds, just fire up the app to find the best restaurant for Wild Game or the eatery that serves your favorite Breakfast Burrito. A cool feature is the Special Offers category, which lists specials from all the area restaurants. These are updated every day by the individual restaurants. For the locals in proximity to the Ski Resorts of Vail and Beaver Creek, this is a must have app. And they will find the deals very useful especially during the off season. 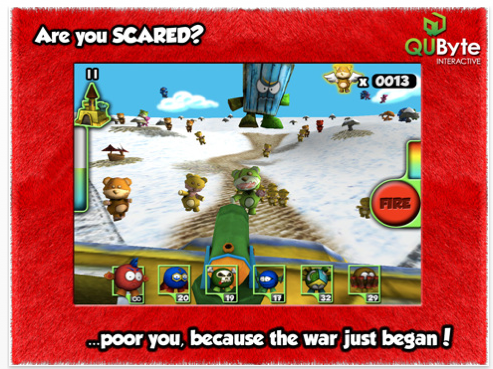 QUByte Interactive has announced the release and immediate availability for Plush Wars 1.0, their new 3D-style tower defense game for Apple’s revolutionary iPad device. Help defend the castle, shooting down the gruesome yet fluffy ZomBears. Define your defense strategy using specially designed traps and ammo. Breek has announced the release and immediately availability of The Mystery Lab 1.0, their new app developed for Apple’s iPhone(TM), an original minesweeper with great special effects. Who will get the high score? Who will reach the highest level? A military lab, a hidden secret… A long time ago, a military laboratory was buried under this ground. Terrifying experiences have been conducted in great secrecy. Nowadays, a real estate project is under building… in this very ground. As an expert with explosives, you must help the workers to clean up various areas. Avoid the destruction of the town in the process. 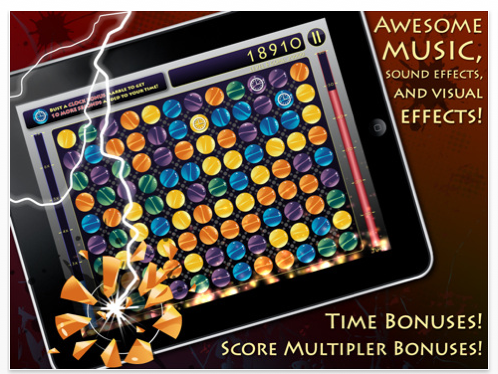 Our app offers a minesweeper on steroids, doped with original graphics, beautiful animations and a mind-blowing gameplay. 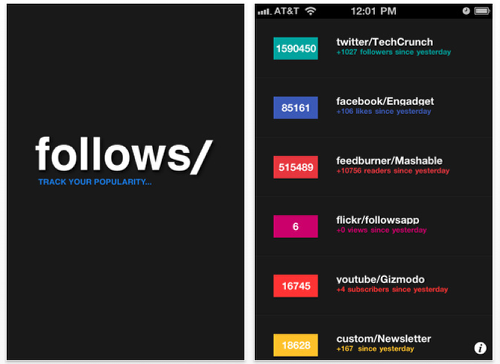 Independent developer Shalom Levytam has announced the release of Follows 1.0, an application for the iPhone and iPod touch that lets you track your online popularity. Use the Follows app to chart how many followers, friends, likes, subscriptions, connections or views you’ve accumulated across various social networks and services including Twitter, Facebook, YouTube, and more. Follows is not only a fun way for individuals to track of how popular they are in comparison to their friends. It is also an important tool for businesses to track their online growth and market reach. Users can even provide a custom URL to Follows and have it track private data such as newsletter subscribers, comment counts, visitors, etc. Just in time for Advent, BCNmultimedia has announced the release of Children’s Bible 3.2 a good tool to start reading the Bible with children. Children’s Bible is the bestseller kid’s Bible comic books and movies app. Each week, the app provides users free access to a 30 pages comic books and a movie based on the most famous Bible stories, making it easy to talk about Jesus and God with kids. Children’s Bible has been on the top 100 of USA rankings in books category since its launching in 2009. "Children’s Bible comic books collection are a good tool to start reading the Bible with children," stated Publishing Manager Toni Matas. "And an easy way to talk about Jesus and God with your kids." 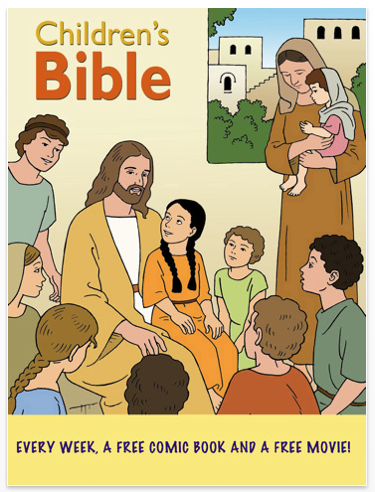 Children’s Bible contains movies and comic books on the Bible for children between ages 3 and 13. The content of Children’s Bible covers the most important passages of Sacred History and the Gospels. Small Wonders, developers of the popular iPhone game Battle of Puppets, has announced the release of their new hit, Yum Yum Boy. This is the first iPhone game based on a true story, a Internet guy who loves junk food and hates vegetables. Your goal in this addictive game is to eat all the junk food you can to satisfy your gluttonous appetite while avoiding your mom, whose goal is to feed you with vegetables. 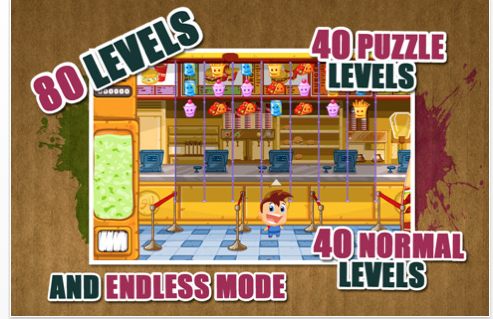 YumYumBoy is a funny and exciting game that combines puzzle and arcade in the best possible way. The simplicity of the controls to move, take the food, make chains and the magic spells is amazing and very intuitive. The magic spells bring to Yum Yum Boy another very interesting theme: Anime. By collecting a certain item, the character becomes Son Goku or Mazinger Z and performs their favorite attacks. Blue Onion Soft, Inc. has announced the release of Bubble Dobby, a bubble shooting game of quality and great fun. Our faithful house elf Dobby is coming to iPhone with colorful bubbles. Your mission is to pop all bubbles with another bubbles Dobby passes you. Like its previous masterpieces, Jewel Craft and Puzzle Marble Deluxe, Bubble Dobby introduces new standard on popular genres: elaborating design, exhilarating music and effect, and new awesome play mode – Battle. 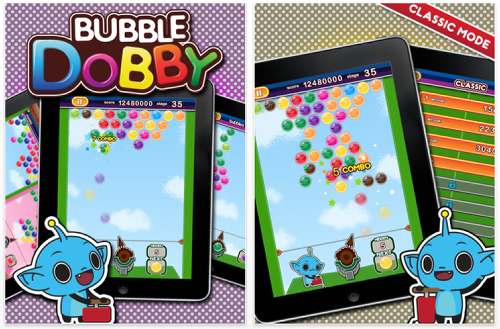 Bubble Dobby is designed to provide fun for players of all ages with addictive infinite levels of Classic Mode, 40 challenging stages of Puzzle Mode, and stunning pleasure from Battle Mode. Beside its unique character, Dobby, 10 beautiful color bubbles and 5 special bubbles make Bubble Dobby more attractive and enjoyable. Monster Mobile’s premier iPhone application, Monster Free Apps, is a completely free iPhone application that sends users a daily push notification of paid apps, across multiple categories, that are available for free in the App Store. iPhone users no longer have to scour iTunes looking for the best free apps – Monster Free Apps brings the offers to them. Since launching, Monster Free Apps has alerted users to three or four apps per day that were paid but are now available as free apps (for a limited time). Retail prices of the paid apps range from $0.99-$7.99 per app, saving users an average of $3-$8 per day. In just the first two weeks, Monster Free Apps has presented a savings of over $120 to its users (including bonus apps that are unlocked by sharing the Monster Free App with friends). 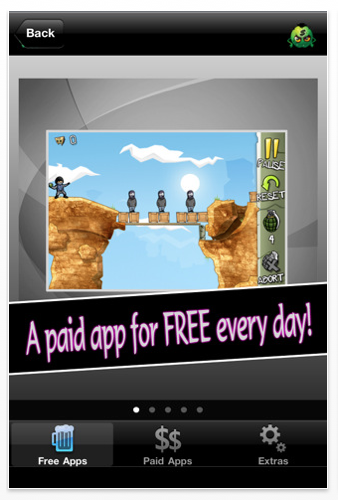 At this rate, annual savings on paid apps could surpass $3,000 for users of Monster Free Apps. Mediaism Ltd today announced the release of DeBug 1.0 the ultimate math and reaction game for iOS. The game features fast paced game flow with a cute forest atmosphere challenging both the player’s arithmetic skill and reaction time. It is so simple to play Debug. 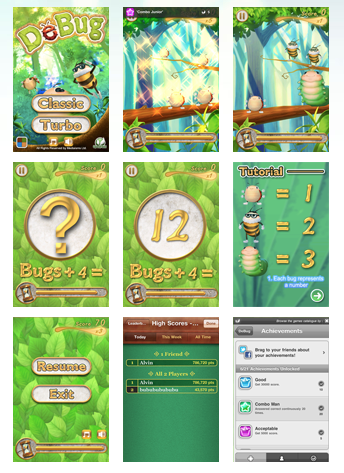 There are three different bugs in the game, which are beetle, bee and caterpillar. They represent 1, 2 and 3 points respectively. Starting the game, different bugs are shown on the tree. This scene will show up for a while and as the level progresses, the showing time is shortened to as low as only 0.016 seconds, challenging the ultimate reaction time of human eyes. The scene then switches to a formula view with a big question mark. 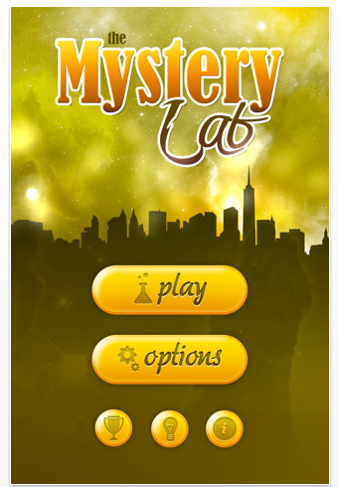 The player has to tap the screen for exact times to answer the final result of the formula. There are 2 game modes; Classic and Turbo. Beginners may try the Classic mode to get familiar with the gameplay. Turbo mode allows much shorter time for reaction and is designed for expert players who want more exciting gaming experience.